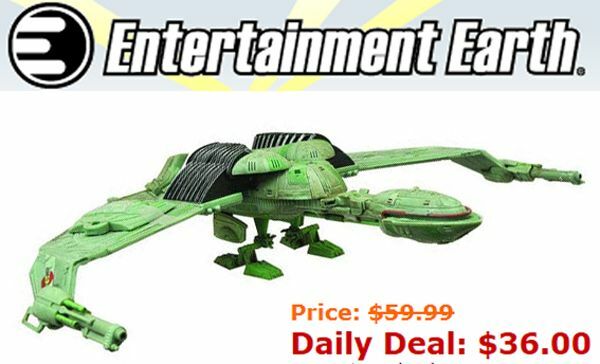 Super Sale At Entertainment Earth Today! "A Collector's Trek #7" Is Now Up At StarTrek.com! Here's all the extras from the Sci-Fi Channel Special Edition of "Obsession". For some reason, when this episode was first shown, the intro segment was for the wrong episode... so this one is a bit shorter than most. 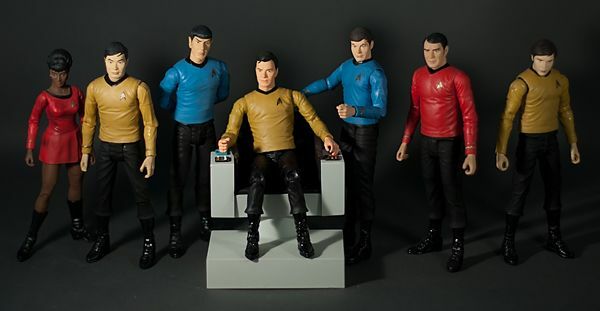 So I am not sure if you guys have heard or not, but Diamond Select Toys recently unveiled plans for a new Star Trek figure line called "Star Trek Select". 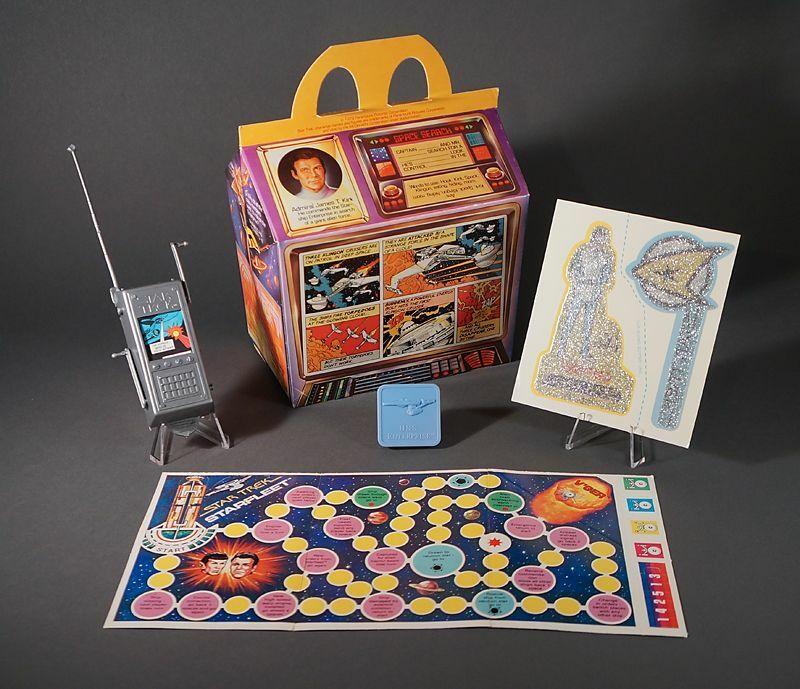 The new line will consist of individual 7" figures featuring packed-in dioramas and interchangeable parts. 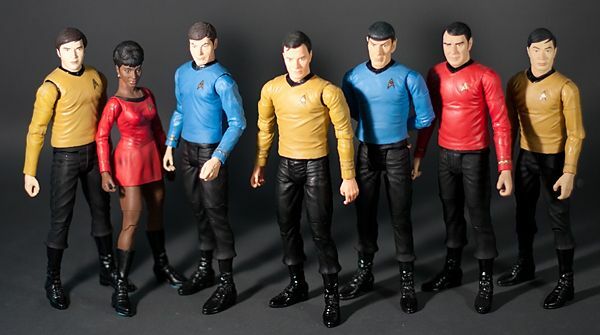 While I am all for new Trek toys, it seems these figures will lean more towards pre-posed stances as over the high articulation of the older DST efforts. 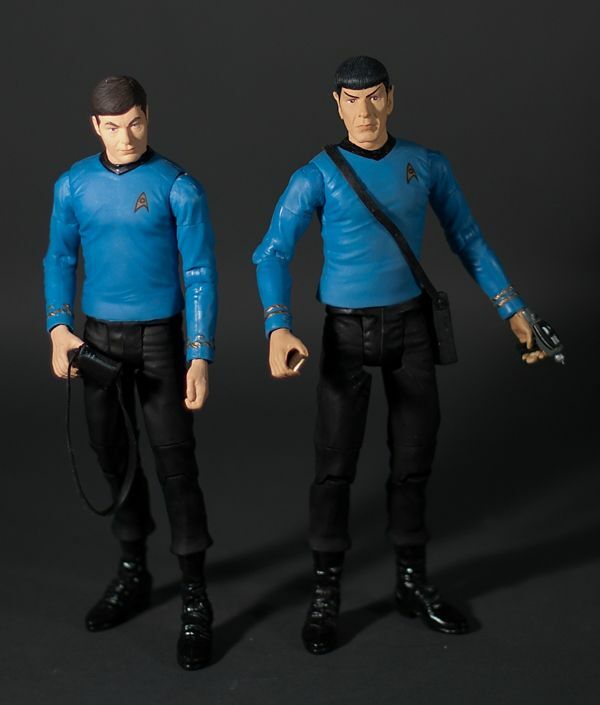 You can check out pictures of the first release in this line, Spock, right here: Star Trek Select Spock. With this new announcement pretty much putting the nail in the coffin of the old line, I figured it would be a good time to give you my version of a definitive AA/ DST crew. Some of these are pretty easy picks... others not so much. Some are gonna take a little elbow grease and extra dough to make happen. But you want the best, ya gotta work for it... And of course, this is all my opinion here. You may not agree with my picks, and that is totally cool. These just happen to be my personal picks after years of Trek collecting. So without further ado... My ultimate AA/ DST Classic Star Trek Crew! These are pretty simple, and require very little effort to make "perfect". Both McCoy and Spock were best represented in their DST reissues due mostly to the gold used on their rank braids and uniform insignias. The original releases from Art Asylum (while great) featured a cheaper gold paint that I've noticed turns a greenish color over time. Just like usual, DST only saw fit to include a "Live Long & Prosper" hand on Spocky-poo... So you'll need to crib one off a different figure to really make him shine. For the 2 immortal red shirts, I'd recommend hitting those reissues yet again (and you'll already have Scott thanks to the Spock 2-pack). Not only ifs the gold better, but unlike the original Art Asylum versions, the red actually matches between the two! Who'da thunk it. Mr. Scott (originally spotlighted HERE) is pretty much ready to go right out of the box... except for one essential accessory- Liquor! 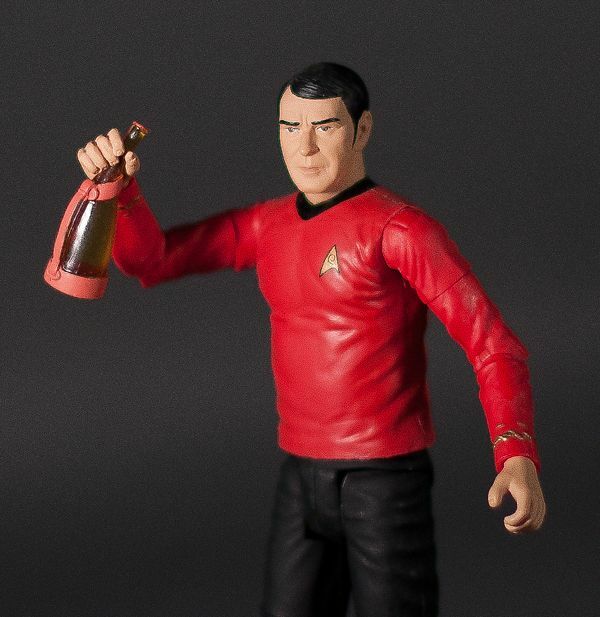 Thankfully, you'll be buying a DST Casual Kirk soon enough, so you'll have a bottle of brandy ready for Scotty's eager mitts. 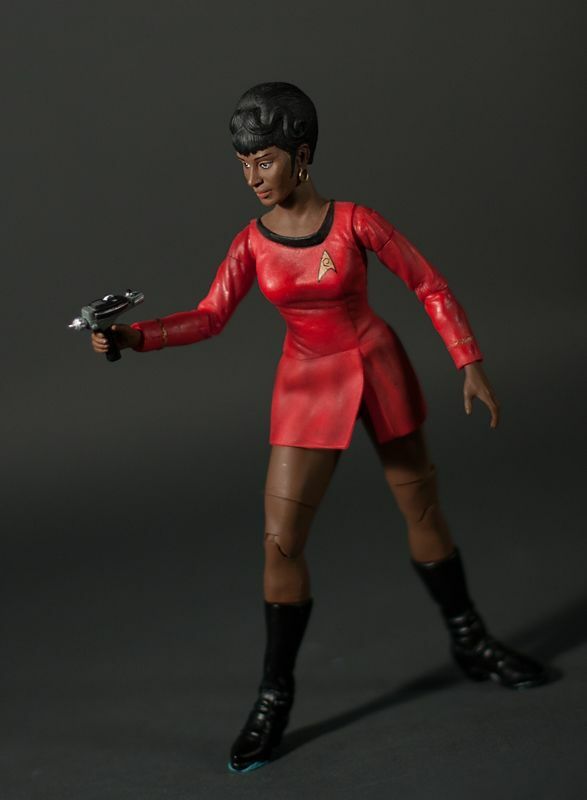 Uhura (who was originally spotlighted HERE) is also ready for display right out of the box with the exception of one accessory... A phaser! Again though, you'll be picking up that extra Kirk that will supply the lovely Uhura with the firepower she was sorely lacking. I know I am starting to sound like a broken record here, but once again the DST reissue 2-packs offer the best version of the character in this style. 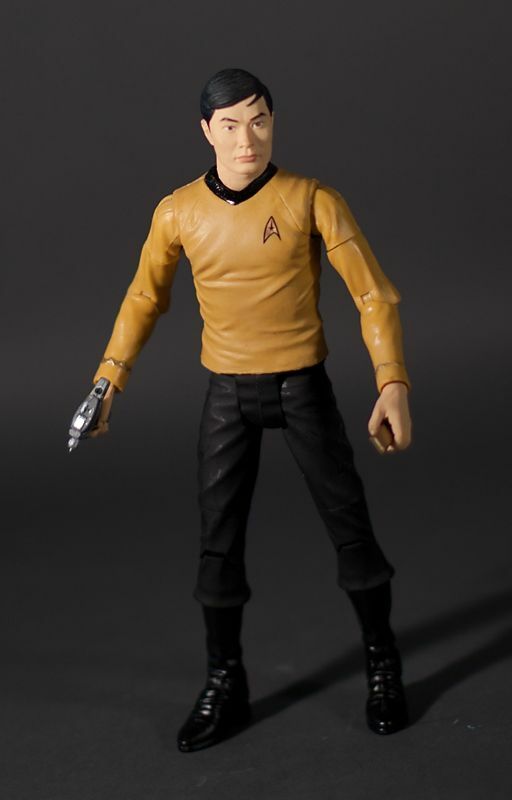 The gold is great once again, but more importantly, the yellowish gold shirt is much better match to most of the "standard" DST Kirk figures. The original Art Asylum versions (much like Scotty and Uhura) didn't match up between characters, so this Sulu offers a great starting point for a matching crew. 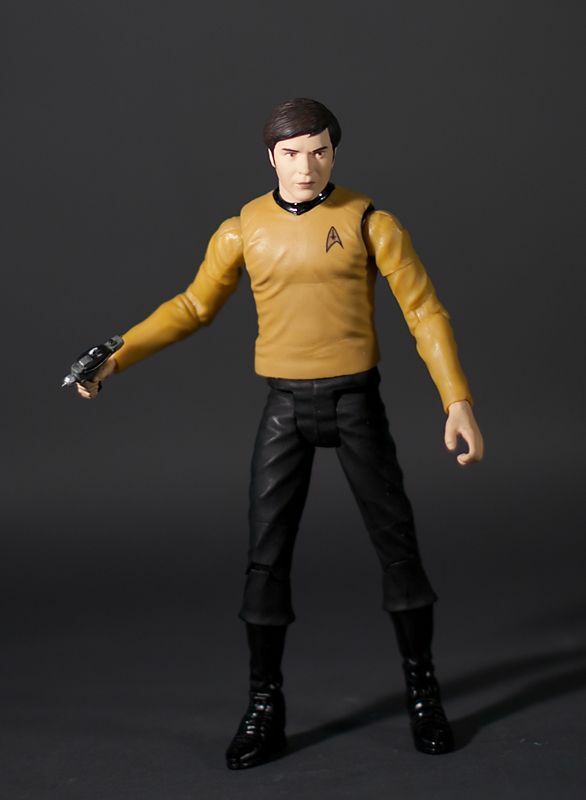 The only bummer is that he was only released in the 2-pack with MCoy, so you're gonna be stuck buying 2 to complete the custom Chekov and Kirk needed for our ultimate crew. Yep. You read that right... Time to get into the tough stuff. I am gonna make a bold statement here- AA/DST never released a truly definitive gold-shirt Kirk. There. I said it. Don't agree? Well, show me one that has a great head sculpt, a shirt that matches Sulu & Chekov, and a tunic that doesn't look like it was fitted for a 7-year-old girl that only eats crackers for every meal. Can't do it, can ya? That is because there isn't one of those. The first AA release (featured WAY back HERE) was pretty good, but it featured a shirt that ended up not matching Sulu or Chekov. Then DST took a few turns, and each one ended up using McCoy's shirt mold for some reason, leaving you with a weird ill-fitting look like the Kirk featured HERE. Oh, and almost all of them used the original AA head sculpt, arguably the weakest of the entire crew. Poop. So what do we do about Kirk? Glad ya asked! 1.) Get some water to a boiling point and then remove it from the heat source. 2.) Dip that Kirk's torso in the water for about 60 seconds or so to get the plastic soft. 3.) Pop his head off. 4.) This part is a little tough. You're gonna need to slowly work that rubbery shirt portion up and off of his body. This probably the hardest task of the entire job and will take great care to get it off without tearing the material (which you will need to do since we will be using this shirt later on). Hopefully, practice will make perfect... as you're gonna need to do this a few more times. 5.) 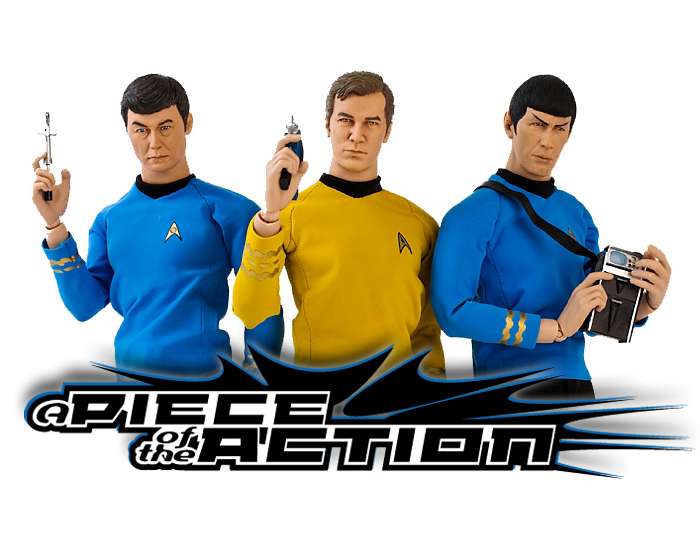 Repeat steps 1-4 with that extra 2-pack reissue Sulu I mentioned you would need earlier. 6.) 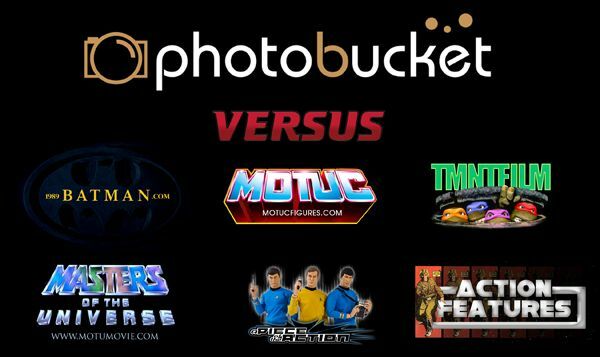 Work the Sulu shirt onto the shirtless Kirk body. Chekov presents the biggest challenge of the bunch, since he never got a DST reissue... Meaning we don't have a really good base to start with. 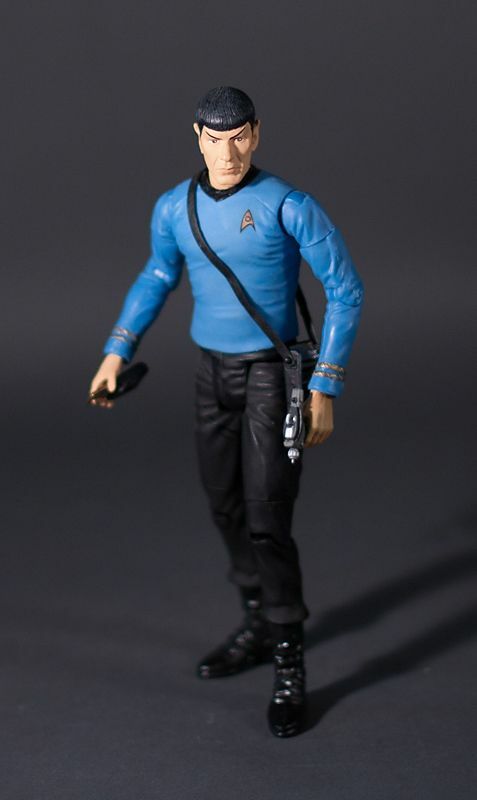 Let's look around at what we have left though... Looks like we have a reissue Sulu body with no shirt, and the shirt we took off of the reissue Kirk. Well that looks like a good start. We do have a problem though- Sulu has rank braids on his arms, while Chekov's rank as ensign means he had no rank braids. Poop again. While we could try and dremel or sand them off, that may leave us with uglier arms than what we are hoping for. Oh... We also don't have a Chekov head. Poop to the third power. Whatever shall we do? The missing head is actually the solution to both our problems... but also means forking over some cash for another figure. Head on over to eBay or your favorite secondary-market dealer and snag one of the old Entertainment Earth Exclusive Mirror Chekov figures (spotlighted HERE). Using the same methods we discussed before, pop the head off Pavel. We now have the head we need for ultimate Chekov! Now we just need those arms. This part is a little tricky; You're going to need to pop him apart at his mid-torso ball joint (the point of articulation hidden under his shirt that allows him to hula hoop). You can do this the same way you took off his head- Stick him in boiling water and just yank the upper joint off of the lower one. 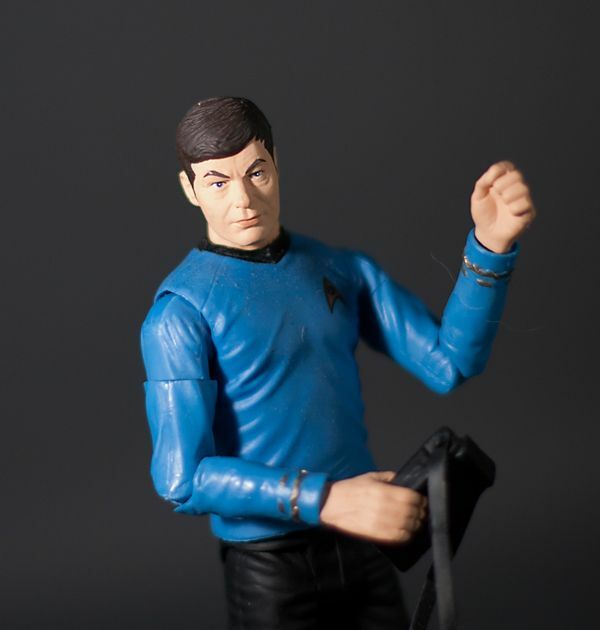 Once you have his head and his upper torso taken off, remove that rubbery Mirror Universe shirt. Now take your shirtless Sulu from before, dip him in that hot water, and remove his upper torso just like you did Chekov's. 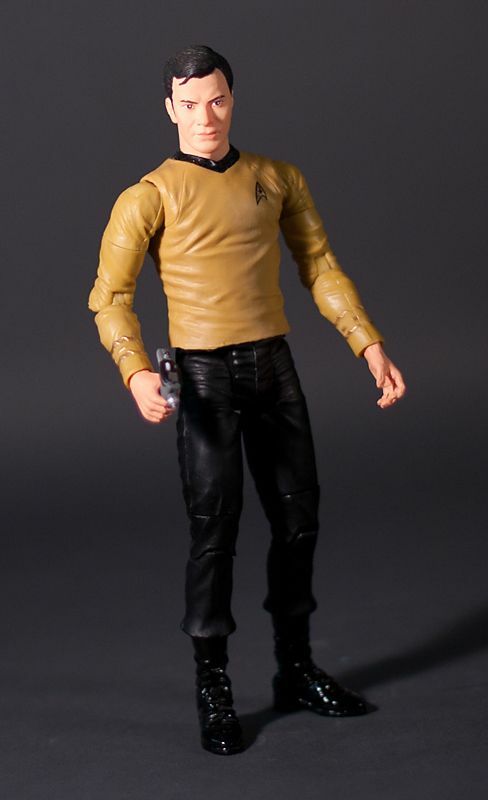 Pop the upper Chekov torso and arms onto the lower torso and legs of Sulu and slip that Kirk shirt you had sitting around onto the body. Since that Mirror Chekov was made in a very similar color to these DST reissues, you now have ensign arms that match the gold shirts of the 2-pack releases. Finish up by heating Chekov's head up just a bit and attaching it to his new body. 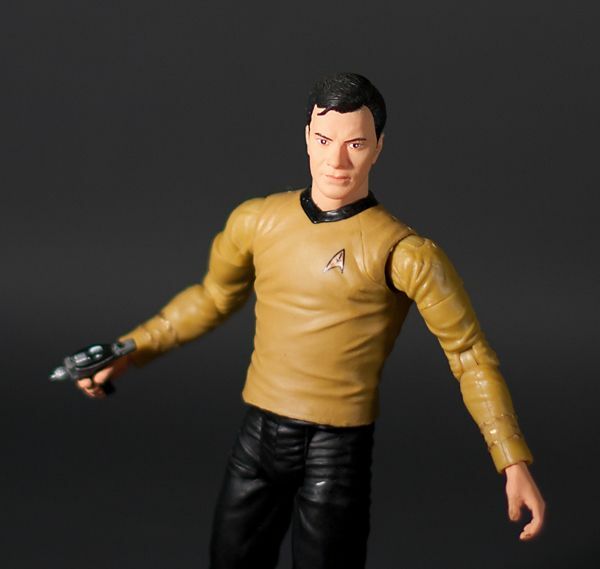 Voila... You now have a reissue-style Chekov, and all it really cost you was the price of the Mirror version (since we already had the Sulu body and Kirk shirt from our ultimate Kirk custom).